Leave it to Ellen to find talent that truly entertains. Her staff searches the Internet and always finds pint-sized people to make us laugh, wonder and even cry. Sophia Grace and Rosie are already stars. And who could forget little Kai who sings his heart out to Bruno Mars' songs. 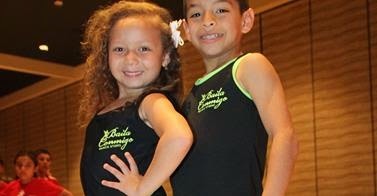 This time she found World Latin Dance Cup Champions 6-year old Beberly Devers and 8 year-old Kevin Tellez while surfin' around Youtube with close to 2 millions views. Beberly and Kevin both train in Hudson County. Their salsa teacher Johana Vasquez has been teaching Kevin since he was 5 and Beberly for just one year. They have only been dancing together for a year. Both of them have won championships but with other dancers as partners. Ellen asked Kevin what he liked about his partner and he said, "She's smart, and she's easy to lift." Ellen then likened his response - with a smile - as to how most ladies choose their purses.